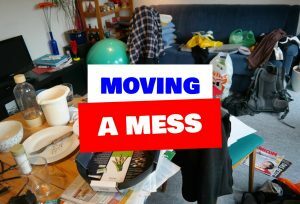 How To Move A Messy Home? Let’s be honest – most of us do not have enough time to keep everything neat and tidy. Sure, we like order as much as the next guy, but really – after a busy day at work you just do not care whether you fold your shirt or not. However, these little things pile up rather quickly. Soon a small overlook here, a minor disregard there and your home turns into a complete mess. But you get used to it, don’t you? Well, it is all fine, when you are living by yourself (or maybe with an equally disorderly partner/roommate), but at some point you will have to move. And then that mess turns into quite the challenge. Of course, you can call a Chicago moving company to take care of the entire move, and they probably won’t mind the mess all that much. But you won’t feel comfortable, would you now? So here are some steps to moving a messy home without that much trouble. If you want to get into organizational mood, you should start by going about your place and start picking up obvious trash. Things that you don’t want in your home altogether. These may even be items that are not necessarily garbage, but are still for giving away or donating. Now, this isn’t the time to be thorough though, so don’t overkill it. Just make sure you have taken out quite a good chunk of things, so that you’d at least know that the majority of what is left behind are items you actually want. After you have put yourself into working mood by cleaning a bit, you should start by ordering your storage spaces. Go about your closet, garage and attic and order things there. Free up as much space as possible and utilize it to its best. That way you will have some free storage space for when you start organizing the rest of your home. If your entire home is a mess, you can’t just start wherever you want. After you’ve done organizing your storage spaces, tackle the biggest room as well. Why it? Because that way you will know you have even more space that is put in good order. And you can use it to temporary store things from other rooms while you deal with the mess there. By this point you should have the hang of the entire process. So just go around, whichever room you pick and sort the mess there. You may start with the kitchen, because these places tend to be very disorganized – or you can take care of your bedroom so that at least you will have a good night’s sleep in an ordered place. With these tips you can easily go and make your place a bit more orderly. Then you won’t be ashamed to call the movers to take care of the job. Have a safe move!